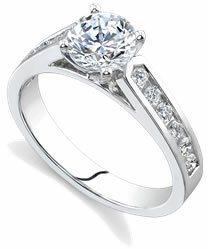 There are few things that compliment the fire and flare of a fine diamond more than its color. While many people prefer flawless, completely colorless white diamonds, they're very rare and aren't for everyone. On the other end of the spectrum are colored diamonds -- those gems among gems whose very pigment makes them special. Sure, the other three C's (clarity, cut, and carat) are important but the right color can add a great deal of value to a diamond, not to mention that extra-special touch of intrigue and allure. In the gemology trade, colored diamonds are referred to as "fancy" diamonds, and recently they've become de rigueur for those who can afford them. According to the LA Times, in the last few years the demand for colored diamonds has exceeded the demand for the preceding decade. Why this sudden interest? Blame it on the stars -- the ones in Hollywood, that is. Perhaps the most famous of recent colored diamonds was the "Bennifer," the six-carat pink diamond that Jennifer Lopez wore during her engagement to actor Ben Affleck. This so-called "penthouse of engagement rings" grabbed the public's attention, as did the brightly colored stones other celebrities were soon sporting. For example, supermodel Heidi Klum recently received a lovely canary-yellow diamond from her honey, British singer Seal. Oprah Winfrey and Barbra Streisand are known for their collections of colored diamonds. The recent popularity of colored diamonds can be blamed on trendiness. But, it's a good trend: diamonds are indeed forever but the colored ones hold their value longest. Colored diamonds can come in literally every color of the rainbow, from purest black to pink, red, green, blue, yellow, indigo, purple, and just about any intermediate hue. Some 300 colors have thus far been identified. Natural red diamonds are particularly rare and can be worth as much as $1,000,000 per carat. Ironically, many colored diamonds result from impurities within the stone. Diamonds are made primarily of carbon but most diamonds form with a few stray bits of some other element included and this produces a colored diamond. Nitrogen gas inclusions result in colored diamonds that are yellow or brownish, and in fact 98 percent of all diamonds are tinged yellow. Boron inclusions make diamonds blue. Other colored diamonds, especially green ones, are formed when the diamonds are exposed to radiation while they're forming. While natural colored diamonds may be out of your reach, don't despair: those clever gemologists have developed a new way to create them less expensively. They do this by treating the less-desirable brown and yellow stones with radiation, followed by heat treatment. The results? Vibrant greens, blues, reds, yellows, purples, and just about any other color you can imagine: much more exciting than their original colors. The best part is, you can afford them! Another alternative to colored diamonds grown in nature are synthetic diamonds. Make no mistake: these are real colored diamonds, grown from carbon provided by nature but they're grown in a laboratory instead of hundreds of miles underground. Various colors can easily be created, simply by adding the right impurities and radiation to the mix. These practices have recently added zing to the diamond market since, for once, there are enough colored diamonds to go around -- and at a price many more can afford. No longer do you have to look jealously on as celebrities flash those massive colored rocks. Not everyone can afford a 6-carat Bennifer, but now, at last, you have some options in the colored diamond market.